By Paul Whitby More and more frequently these days I hear horror stories of tanks wiped out due to the inadvertent introduction of a pest that devastated the system. As I look closer at a lot of these killer incidents it appears that the pest in question is usually something that is relatively easy to deal with, but the approach taken to ridding the tank of the pest caused more damage than the pest could ever have done. A lot of this is due to ignorance of the actual dangers of the pests that we commonly encounter, coupled with a plethora of snake oil type remedies that promise almost magical whole tank cures, yet rarely seem to deliver. My purpose behind these articles is to show you what to look for, how to deal with it and possibly prevent problems before drastic measures have to be taken. Where possible I will try and give both the chemical (quick) cure as well as the biological (slower) approach. It is likely that you will be able to utilize both of these tactics to eradicate the pest and then keep them out. I would also urge you, before attempting any eradication strategy, to read, read and read some more. This is your tank we are discussing and only you can make an educated decision about the best overall tactics to choose. There are a lot of pests in this hobby and for the most part they can be easily dealt with – so if you have an unfriendly organism show up, sit back, relax and read all about them here. Finally- dont panic…unless of course you are unfortunate enough to have something worth panicking about. For now we will start with a few of the most common and easily dealt with beasts– aiptasia and majano anemones. IdentificationAiptasia Aiptasia are small brownish semi-transparent anemones that seem to pop up in every system. 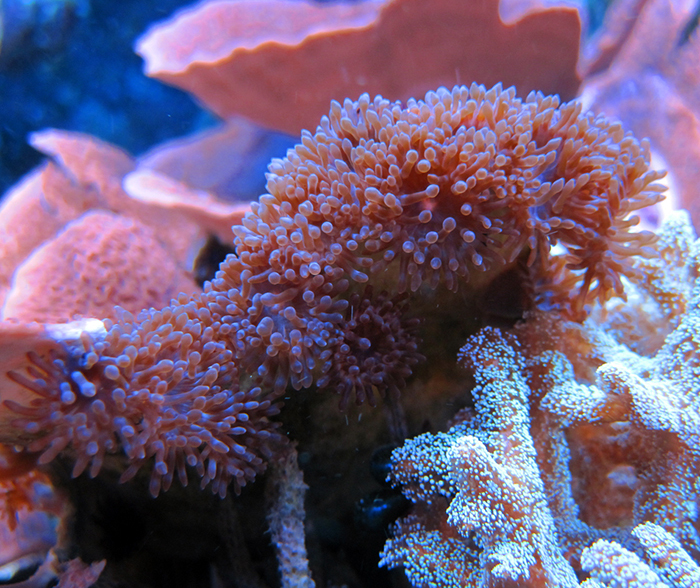 They are commonly introduced as tiny specimens on live rock, sand or corals that have been added to the tank. They are photosynthetic as well as being voracious feeders on anything unlucky enough to come within reach of the tentacles. For the most part they remain small, but I have seen some approaching 4-5 inches in size. Such beasts are easily able of catching small fish and certainly stinging them, if not devouring them. 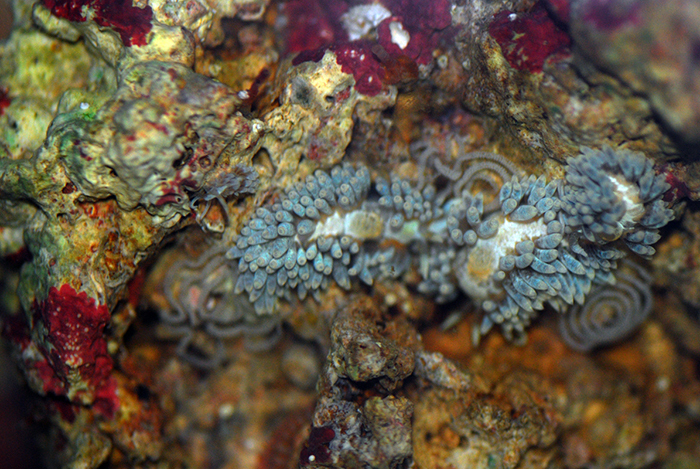 The main problem with aiptasia is that they rapidly reproduce and seem to be one of the fastest growing and spreading of the corallimorphs. It is likely that aiptasia are one of the first pests a new reefkeeper will encounter and the panic that normally follows the identification of a single aiptasia in a tank can result in a strip down of the rock and all manner of other curious behavior. In essence, aiptasia are very easy to remove from a system and should never constitute a problem. There are numerous ways in which a hobbyist can clear their system of these critters. Majano Anemones Majanos are also anemones and are somewhat similar to aiptasia. Like aiptasia, majanos are multi tentacled with an oral disk. They are however, often much smaller and generally more substantial in appearance. They very much resemble tiny bubble tipped anemones. They can come in a variety of colors, from a drab brown species to iridescent greens and reds. As such they are sometimes deliberately added to a system by an unsuspecting hobbyist. Majanos can reproduce very rapidly, and this is the fundamental issue with these pests. One soon becomes many and ultimately a small field of stinging tentacles is present that kills all of the adjacent corals. They can also spread quite rapidly through the water column of the tank and appear in multiple places, where they once again proliferate. In essence, like aiptasia, they can soon reach plague proportions. Aiptasia and Majano control Like most pests we will encounter, aiptasia and majanos can be dealt with both chemically and biologically. I am a big fan of using both, when the chemical option has no long lasting effects on the tank. 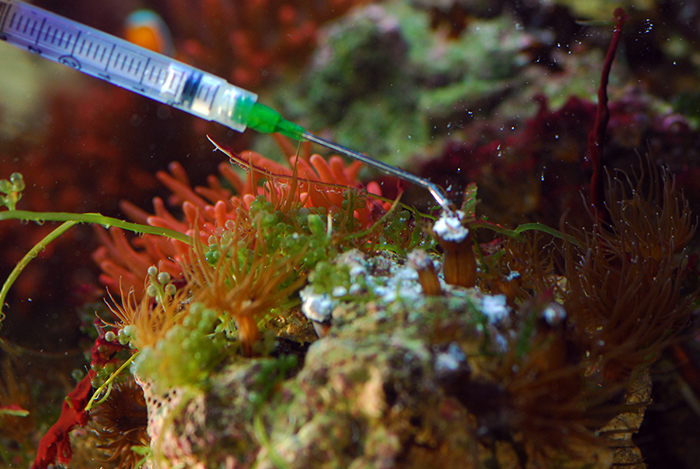 By doing so, you will immediately remove the most prominent pests and those killing corals while the biological control will find all of the other anemones that you cannot see and stop them from re-infesting the tank as time goes by. Chemical Eradication There are a number of tank treatments on the market for aiptasia and majano eradication, and for the most part they all seem to do equally well. The two that I have used and been very happy with are Aptasia-X and Joe’s Juice. Both of these are a thick paste like substance that sticks to the nuisance anemone and rapidly dissolves the body. Both products come in a small bottle which contains more than enough fluid to kill literally thousands of pests. Also included in the packaging are a syringe and a set of angled wide bore needles which allow access to the hard to reach spots. Treating aiptasia with either product is very simple. You simply draw up some of the milky fluid into the syringe, attach the needle of choice and then stealthily creep up to the aiptasia or majano and squirt a tiny amount onto the head. Almost immediately the pest will begin to melt away. Should the aiptasia or majano retract into a small hole, simply follow it into the space and treat it there. Once one is treated, move on to the next. As a small tip- I have found it beneficial to turn off the pumps while doing this. If your tank is very heavily infested I would suggest that you treat part of the tank, kill the pests and put the pumps back on and move to another part another day. Remember that both of these products are chemicals, and while they are relatively safe, minimal treatment is always the best course with a tank. They do however have another drawback which is you are limited to killing only the aiptasia or majano you can see, and if you can see one, there are many more hiding in nooks throughout the tank- so expect them to return to the visible parts of the system over several weeks. In reading various forums and threads regarding aiptasia and majanos, there are a lot of suggestions for homemade alternatives to these products. Of them all, concentrated Kalk is the only one i would suggest as a cheap alternative. 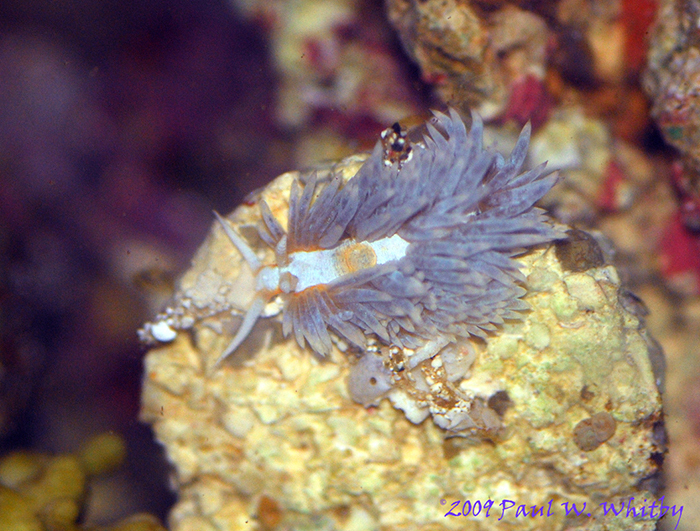 Biological ControlBerghia nudibranchs (B. verrucicornis) Of all the biological controls available for aiptasia, probably the most effective are the berghia nudibranchs. They will not eradicate majano anemones. Berghia are small worm-like creatures, about 1 to 1.5cm long that eat only aiptasia and nothing else. As such, they are excellent predators of the small anemones. Berghia are commonly available through online vendors and are relatively inexpensive. The downside is that a single animal is very slow at eradicating an infestation and is more than likely to be itself eaten by a wrasse before it can do much in the way of aiptasia control. For this reason, it is desirable to add a lot of Berghia to a tank. At first sight, this could appear to be an expensive proposition, however berghia breed like crazy and inside a few months several Berghia can become several hundred. This makes Berghia an excellent group buy and breeding project for local clubs to get the membership involved in. At the bottom of the page I will detail a simple breeding station for these nudibranchs that can easily generate several hundred juveniles from a few adults. Using Berghia in a tank system is easy. One simply adds them to an area of the tank, away from aiptasia and preferably in the dark. I use a wide bore turkey baster for moving these small creatures from the breeding chamber to the tank, I would also recommend temporarily turning off the pumps and allowing the berghia to settle to the rockwork before restoring flow. Do not be tempted to add them to an area of heavy infestation, aiptasia will devour berghia if they are able to sting them with their tentacles. Once added, the berghia will disappear and, over a period of several months, they will eradicate all of the aiptasia in the system. As I said above, many will fall prey to wrasses as well as shrimps in the system, some will breed inside the tank and it is likely that a stable population will be established if enough are added in the initial phase. I would recommend at least three are added to a nano and one per 20 gallons tank volume on larger systems. Once all the aiptasia is devoured, these little creatures will die through lack of food, but they can always be passed along to another hobbyist should that be the case. Peppermint Shrimp (Lysmata wurdemanni) Though these small reddish shrimp are often touted as a cure for aiptasia, my personal experience is that they can be hit and miss. I have also known them to be a little less than discriminating in what they choose to eat, so keep an eye on their feeding habits if you can. They will not eat majano anemones. For the most part, best results seem to be obtained with juveniles approximately 1.5-2 cm in size. When purchasing peppermints, ensure that you receive what you seek. 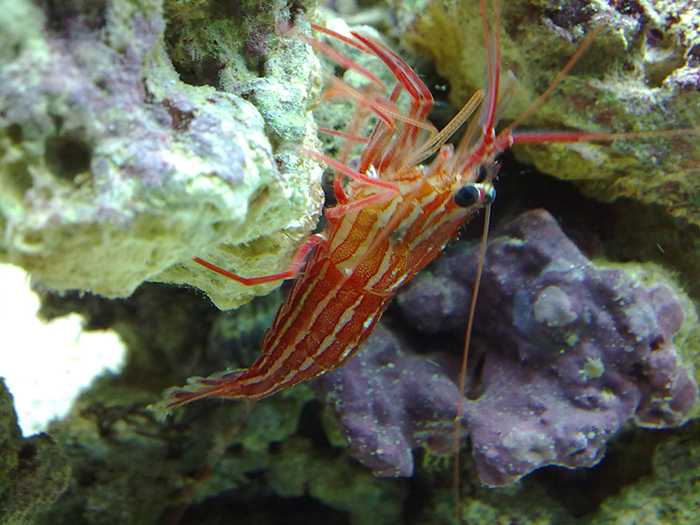 Often, camel back shrimp (Rhynchocinetes durbanensis) are confused with peppermints. These will not eat aiptasia, but will happily devour many of the soft corals in a system as well as sea apples and brittle stars. The key to identification is the distinctive hump on the back of the camel that is absent from the peppermint and the clear rostrum (or beak) of the peppermint and the white striped rostrum of the camel. A group of 5-6 peppermint juveniles seem to do best and will provide long term protection from future infestations. Butterfly Fish Another animal with an appetite for aiptasia are the butterflys. 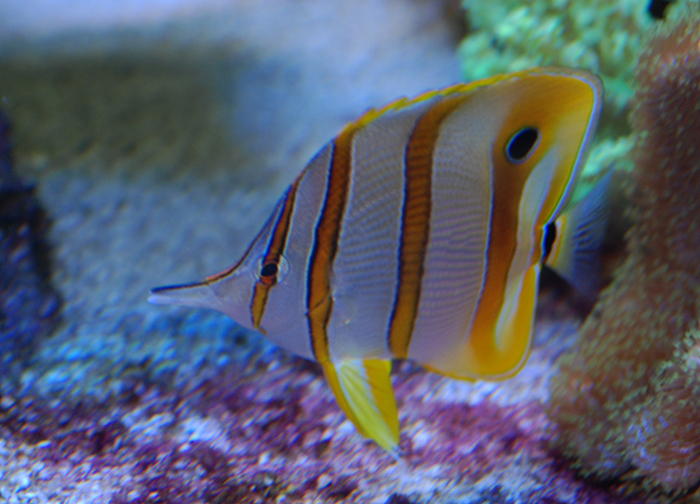 Over the numerous years I have been reefkeeping I have seen copperbands (Chelmon rostratus), pearl scale (Chaetodon xanthurus), raccoon (Chaetodon lunula) and long nose butterflys (Forcipiger flavissimus) eating these small pests. Most of these fish are readily available in the hobby however their longevity in captivity can be quite short. This could be due to various feeding requirements of individual fish, coupled with a lack of captive breeding. As these fish are caught as young adults they have already established feeding preferences and getting them to eat alternate foods can be an issue. In the wild, and in your tank they will devour small worms, fan worms and other sessile invertebrates- often eradicating all of these small critters. Before purchase, ensure the fish you have selected is eating a food you can readily supply to your tank. Small meaty foods such as mysis seem to do particularly well. As with peppermints, not all will eat aiptasia, but most will, hovering above the offending pest and sucking it into their small mouths. Watching these fish hunt aiptasia is most gratifying. Aiptasia eating file fish (AEFF) (Acreichthys tomentosus) These fish are a relatively new addition to the hobby and as such are creating quite a stir. 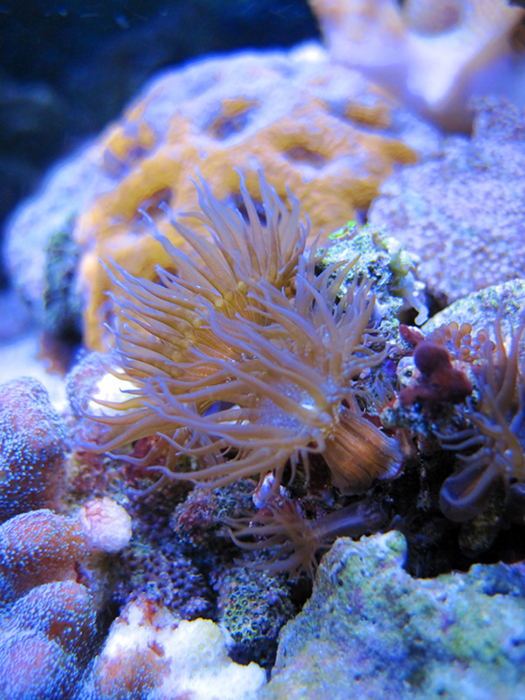 They are voracious predators of both aiptasia and majano anemones. It is this fact that makes them especially desirable. The AEFF is often seen for sale as a young adult, approximately 3 cm in length. It is likely that at the time of purchase the AEFF is doing its utmost best impression of a dead leaf floating around in the water. Do not let this meek appearance fool you, these small fish can, and will, move extremely fast should you try to catch it. They are relatively easy to acclimate to our systems and seem to accept a variety of foods, mysis being preferred. Once the fish has gone through quarantine, is eating happily and is now in the tank, it is likely that it will appear to do nothing to the aiptasia population. For some reason it usually takes these guys about 10-14 days before they begin to eat aiptasia. Once started there is no stopping them, and in a few weeks all of the pests will be eradicated. The same goes for majano anemones. Of course, there is a down side to such wonderful pest controllers. Sadly, some AEFF also appear to enjoy snacking on a variety of other items in the tank. 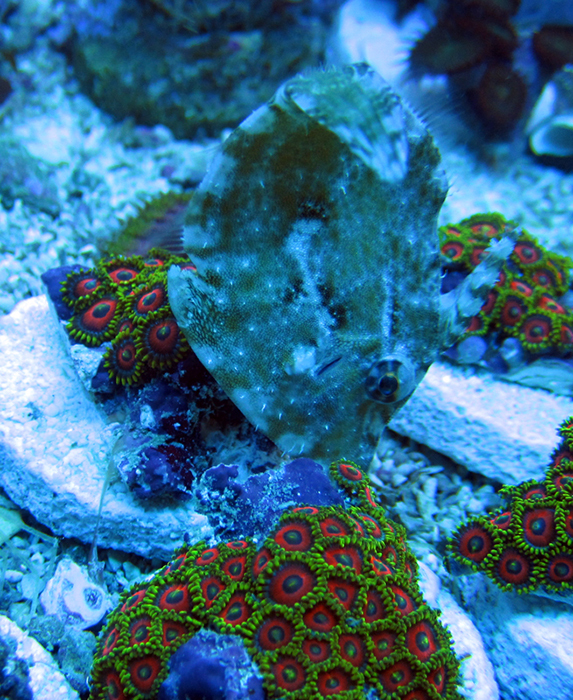 I have seen them eating zoanthids, yellow polyps, palythoa, LPS and numerous other corals. Normally they seem to take a liking to these other corals after the aiptasia/majano issue has been resolved. Fortunately, they are easily captured as they are almost lifeless during the dark hours. It is common for them to attach to a rock or other such substrate at night and resume the mimicry of a leaf. Simply turning the lights on in the middle of the night will allow you to catch the fish and place him in a tank where he will not cause trouble. My experience is that about 25% of AEFF go rogue after eating aiptasia and about 10% never touch the pest anemones. Since these fish are very hardy, they are great to be passed from system to system (with suitable QT between moves). Breeding Berghia The propagation of Berghia is a very simple process as they are extremely prolific breeders. So long as potential predators are not introduced in to the system, the babies are easily raised to adulthood. The equipment requirement is minimal. All you will need is a small tank, an air pump and hose, a few adult Berghia and a steady supply of aiptasia. Should you decide on this, and you have space, I would recommend a 10g, or smaller, tank as ideal. What I do (and feel free to modify this to suit your space and needs) is half fill the 10g tank with fresh saltwater and place a mark on the side of the tank at the water level. This is then placed in a sump in an area that is either unlit, or only dimly illuminated. I do this such that the water of the sump helps retain a constant temperature of the water in the tank while preventing an algal outbreak. Once sited, I take the air pump with the hose and set it up that it slowly bubbles air through the water in the breeding tank. The flow needs to be low enough that it does not create significant water movement, but does break the surface tension and film that may form. Once set up and just before the Berghia arrive, I add a dozen or so aiptasia to the system. Ideally these need to be scraped from the glass of the tank as opposed to using pieces of rock with aiptasia attached. The reason for this is to avoid the inadvertent introduction of pests such as copepods and bristle worms which will eat the berghia eggs and young. I also like to add some rubble to the system, clean dry frag disks, or some larger coral rubble that has been cleaned is ideal. Once established, I order the berghia. Generally I will order 6 adults. These need to be slowly acclimated and then carefully added to the breeding tank in an area away from the aiptasia. Once added, stand back and let nature take its course. Inside a few days you will notice the aiptasia has been eaten, so the regular addition of new aiptasia is a must. You will also notice small white sworls of eggs, as shown in the images below. After a few weeks tiny white speck can be seen that rapidly grow to usable size of 1+ cm. Obviously as the population of Berghia increases, so does the collective appetite and thus lots of aiptasia need to be added. In the past I have set up a second tank to breed aiptasia to help supply the demand for food. As the adults are observed, they can be removed and added to the display tank to eat the aiptasia there. This can be done with a wide bore turkey baster or by transferring small rocks with berghia on them. While the breeding station is running, it is important to keep the salinity stable- this is the purpose of the mark where the original water level was. Top the water back up to this level frequently with RoDi water. Water changes should also be performed to keep the water fresh. Following this simple plan will rapidly generate dozens upon dozens of sub adult nudibranchs for your system. In the next issue we will focus on some of the slightly nastier pests, flatworms! See you then.